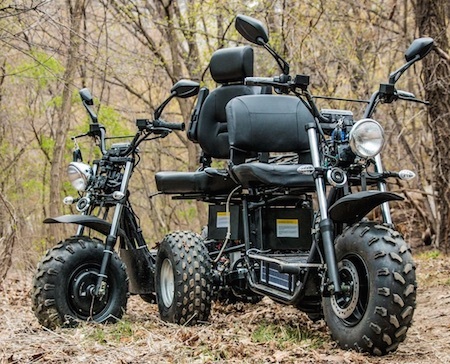 The Boomer Beast is described by Daymak as "the first true on-road/off-road mobility scooter in the marketplace." Like Daymak's existing Beast two-wheeled off-road scooter, the dual-motored Boomer Beast features a built-in 12-watt solar panel that helps trickle-charge the vehicle's 2,580-Wh Panasonic lithium battery when parked. One complete charge, which takes four to six hours using a traditional outlet, takes the scooter up to 90 km (56 miles). Using an accompanying Android app, users can maximize performance parameters such as acceleration, torque and range. The maximum on-road speed is 15 km/h (9 mph), while the off-road speed tops out at 40 km/h (25 mph). The Boomer Beast weighs 120 kg (265 lb) and can carry a maximum load of 158 kg (350 lb). Other features include an LED lighting system, cargo rack, trailer hitch, and dual USB charging ports. ...the Academy of Natural Sciences in Philadelphia was filled with the usual throng of pleasure seekers, each in his own auto-car. Noiselessly, on rubber-tired wheels, they journeyed down the long aisles, pausing now and then before this exhibit or that which attracted their individual attention... Finally, a boy stopped his auto-car in front of a glass case.